With the C-25 you make the right choice no matter whether you have batches of identical boxes or whether your box dimensions are constantly changing. The highly compact dispenser takes all standard water activated gummed tape in widths from 1-1/2" up to 4", reinforced or unreinforced. 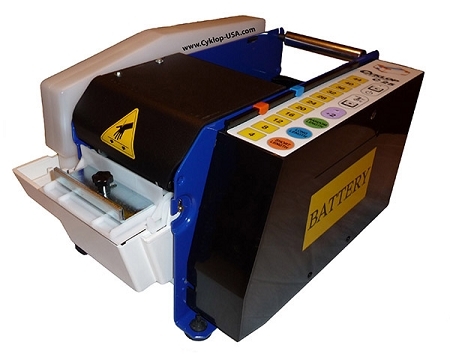 With the exclusive battery mounted under the bottle, the C25 can be placed on a cart and moved around your facility without being connecting to 115v power supply. Recharge the battery at the end of the work shift. 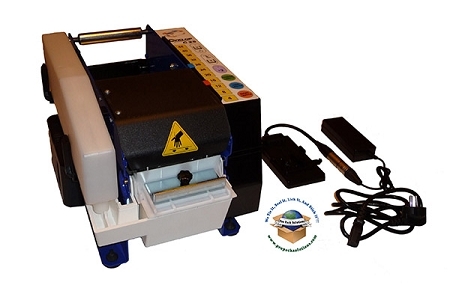 Designed for industrial use, extremely reliable, and user-friendly. Parts susceptible to corrosion are painted or galvanized. Two Pushbutton Keys to memorize lengths for "H" box sealing. Cyklop makes the quietest machine on the market. Normal conversation is now possible next to the machine. All steel side frames, solid electronics, a good moistening delivery system, large water bottle are a few of the advantages. Heater standard to help reactivate the hardened dried glues. Power Requirements: 115v 60Hz - To connect battery charger. Factory Warranty: 90 days parts and labor. Click here for the Pdf version w/parts list.